(Nanowerk News) Researchers at Finland's Aalto University have discovered a novel way of combining plasmonic and magneto-optical effects. They experimentally demonstrated that patterning of magnetic materials into arrays of nanoscale dots can lead to a very strong and highly controllable modification of the polarization of light when the beam reflects from the array ("Surface lattice resonances and magneto-optical response in magnetic nanoparticle arrays"). This discovery could increase the sensitivity of optical components for telecommunication and biosensing applications. Magnetic nanoparticles arranged in arrays put a twist on light: depending on the distance between the nanoparticles, one frequency of light (visible to the human eye by its colour) resonates in one direction; in the other direction, light (induced by quantum effects in the magnetic material) is enhanced at a different wavelength. The coupling between light and magnetization in ferromagnetic materials arises from quantum mechanical interactions. These interactions result in magneto-optical effects that modify the properties, such as the polarization axis or intensity of the light. 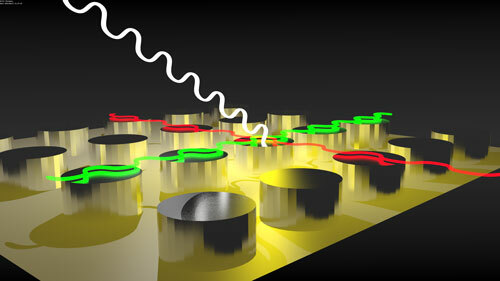 Interactions between light and matter are enhanced at the nanoscale. This is a key motivation in the field of plasmonics, which studies light interacting with metal nanostructures. A nano-sized, metallic nanoparticle behaves very much like an antenna for visible wavelengths; such antennas are familiar to us in numerous everyday devices that operate on much longer radio- and micro-waves. The researchers took advantage of a phenomenon known as surface lattice resonances in which all the nanoparticles, the little antennas, radiate in unison in an array. The key to this is to assemble the magnetic nanoantennas on a length scale that matches the wavelength of the incoming light. In periodic arrays, nanoparticles interact strongly with each other, giving rise to collective oscillations. Such behavior has been previously reported in noble metal nanoparticles and researched extensively at Aalto University in the Quantum Dynamics (QD) research group. Now, a collaborative effort between QD and the Nanomagnetism and Spintronics (NanoSpin) group shows that such collective oscillations can also be observed in magnetic materials. The surface lattice resonances enhance the light polarization change in ferromagnetic materials, the so-called magneto-optical Kerr effect. - A key finding of the study was that the frequency that is the colour of light, for which this happens can be made different from the frequency where the purely optical effect is strongest. The separation of magneto-optical and optical signals was achieved by choosing a different distance between the nanoparticles in the two directions of the array, explains Professor Törmä. Using magnetic materials was not an obvious choice. So far, optical activity in ferromagnetic materials has been limited by their high resistance, which makes it impossible to observe the impressive plasmon resonances seen in noble metals. However, by ordering the nanoparticles in arrays and taking advantage of collective resonances, this problem can be mitigated. This result opens an important new direction in the research field that focuses on the coupling of light and magnetization at the nanoscale, says Professor Sebastiaan van Dijken. The benefits of collaboration between research groups – those working in different fields – was essential for the success of the project. The authors stress that this kind of project would not have been possible to achieve without extensive knowledge in both optics and magnetism at the nanoscale. Their innovative work has created the groundwork for further explorations and has the potential to advance applications beyond fundamental physics. The joint team used the nanofabrication facilities in the Micronova cleanroom as well as the electron microscopy tools available in the Nanomicroscopy Center.